Looks to me like you've been one busy man. Father, machinist, shop foreman, feline caretaker, bridge builder, chief mine engineer. . . . what other feathers have you added to your hat? Terrific Jack Work trees. Can't wait to see them in place - that gorge is going to be spectacular. Your trees look great. You have a lot of patience. Many years ago I made exactly one tree using the Jack Work method. That was enough. We all have limits. Your impressive gorge is coming along terrifically. Thanks Jerry, Galen and Mike for the kind words! Tonight I poured the epoxi for the water under the trestle. Will be fun to see how it looks tomorrow. Or not depending on the result. some updates. 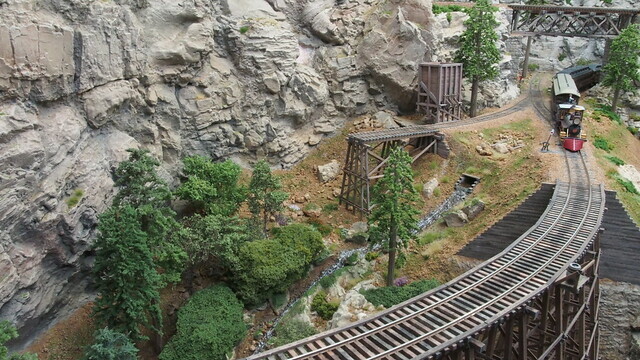 During the holidays I managed to get my Gorge area somewhat finished and the first train could pass over the trestle. I still have some work to do on the trestle with adding brazing that I knocked down when installing it. The mine is also a major build which take up a lot of time. 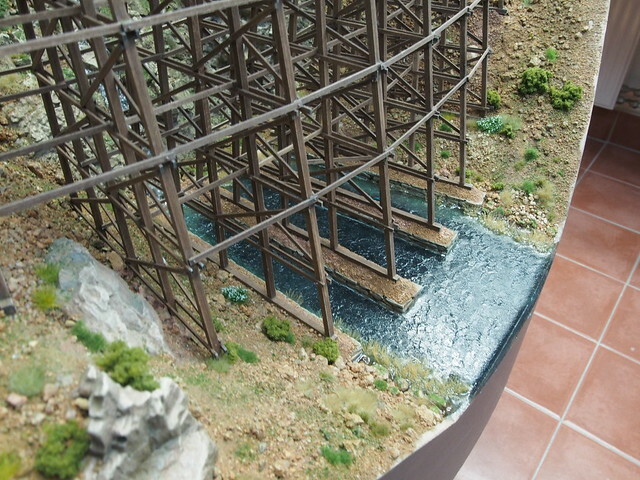 Not so happy with the area as the mine rails and floor will come up quite high. Will look quite spindly. I'm somewhat after the look of the mine on John Olsens Mescal Lines like in the picture below. The switchstand top is one of our Bobs creations and is available in his Shapeways shop. I grew tired of the stock switchstands from PSC so this was a welcome addition. Wow lots of neat scenes there, H�kan! Well, Hakan, I would SO love to be able to be "not so happy" with the look of my scenery if it will turn out looking as good as yours! "John Allen, John Olsen, Malcolm Furlow..."
That's some pretty lofty company, there, Hakan... and you're doing them right proud! Sounds like you and I are on the same page when it comes to some specific elements we want our layouts to accomplish for us. Like you, the creative side of me has long admired the artistry and creativity of "The Terrific Trio" you mention. Pictures of their work are in various of my "Inspiration" folders that I have. There's also some pictures of Frederic Testard's work, and a certain Scandinavian dude that happens to frequent this forum. Where did that cool picture of John O's Mescal Lines come from? 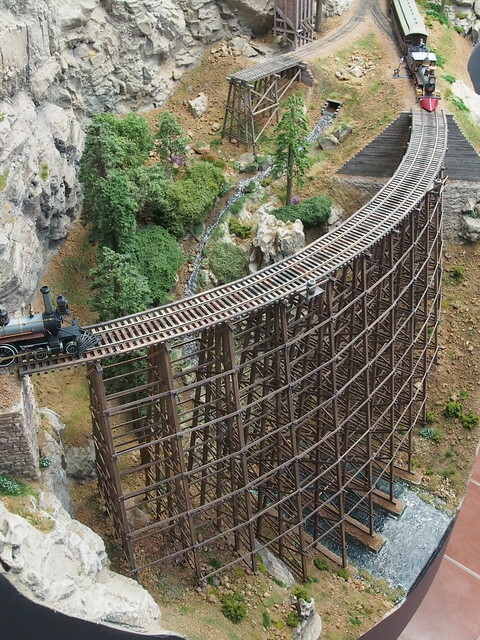 Impressive scene you�ve built. 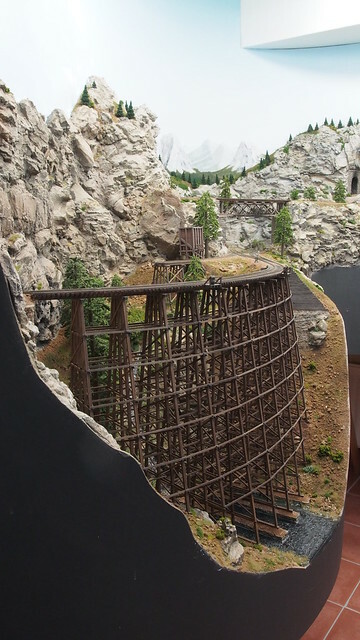 The rocks and the rest of the scenery bits look very realistic, a very dramatic setting for your trestle, which in itself is fantastic. I like the mine also even though you seem to have reservations. H�kan, Frank took the words right out of my mouth. And he didn't even ask! Well I'm going to be back viewing these shots several times. Beautiful trestle, handsome engine and just wonderfully work and results. I�m happy you like it Andre! You humble me comparing. Frederic is an inspiration for me too. 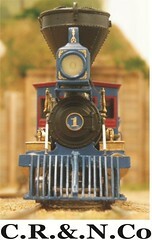 I had my givens and druthers when designing the layout. First I wanted floor to ceiling scenery like John Allen had but it was impossible in the space I had when there were other stuff I wanted incorporated. The cool picture I found on the Internet. It was scanned from a copy of MR. Thank you Mike on the kind words. The rock work has been a chore as I ran out of ideas and rock molds to give a non-repetitive look. 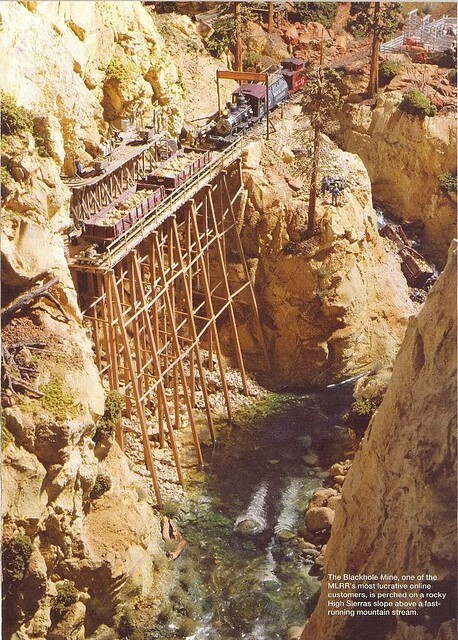 I have my reservations at the moment on how high up the mine decking will come. The hopper I�m building in the challenge thread will determine the height of the ore bin and consequently the mine entrance and decking. Hmm sounds like a backward way to do it though. In real life I�m certain the entrance came first . Thanks Frank and Greg, means a lot to me coming from you. Thanks Bob! And I really liked the switch stand. I did it a little differently than you had as my PSC stands are made of brass. I removed the old brass sign and glued on yours instead. A visual treat to watch over and over. You are a humble person, Hakan. Yet, your work is emerging as TRULY EXCEPTIONAL within its genre. 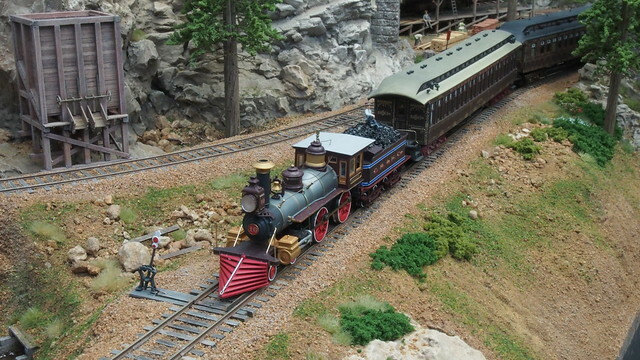 Very few of today's modelers take a creative "fanciful" approach to their modeling. 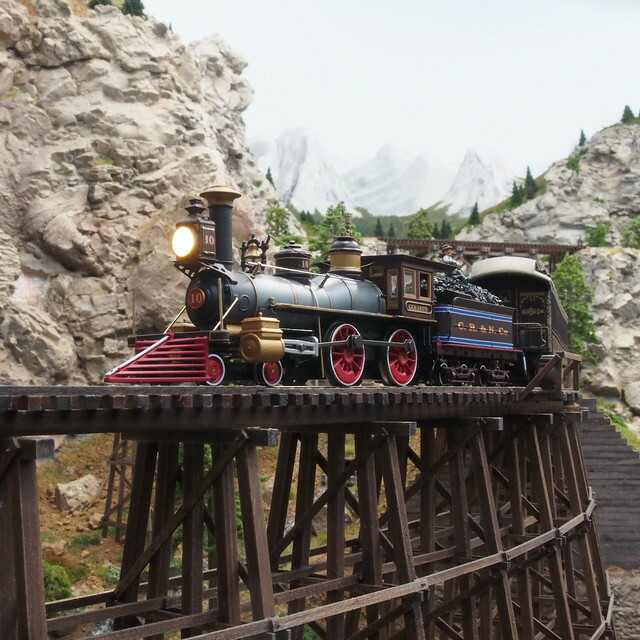 Many are modeling more contemporary scenes (complete with graffiti on rolling stock/etc) and striving for that elusive "realism" quality that no layout can truly be. 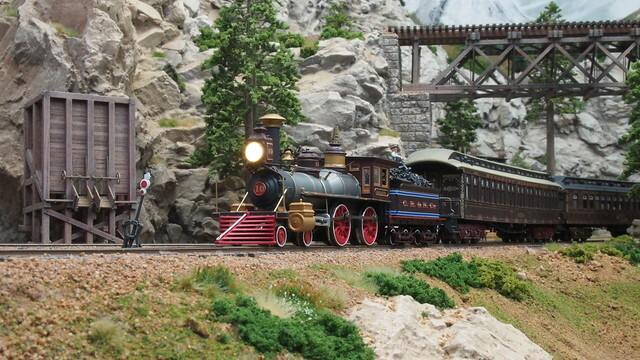 Yes, model photography can make model scenes and subjects look "realistic" (provided the modeler's/photographer's skills are up to it), but a layout as a whole, can never be "realistic"... for it is a layout. Ah, to have unlimited space (and funds and time to go with it!). When I mentally envisioned my "Colorado & Pacific", I too, saw vast canyons, towering peaks, sprawling towns... then reality sets in. From your statements I'm sure you know exactly what I mean. My mental visions took a second hit when I realized that what I was designing was going to fill my space with layout to the point that my work area and storage suffered, as well as the potential for designing a layout I couldn't realistically get reasonably completed in my remaining years. Thus, like you, I have had to scale-back on my scope (Givins n' Druthers) from what I originally envisioned for my projected layout. I now have a "Version 1" track plan. Next I will be sketching ideas to see how they might look in 3D, and I will also be making cross-section scale drawings to see if the idea(s) are actually feasible. In the past, to-scale cross-sections helped me catch wishful thinking vs reality before the lumber was cut! So, all layouts have their compromises. Therefore, we all do the best we can with the space we have and what our abilities will allow. Ah, yes, John Olson! "Back in the day", I remember how John O's work was pretty much overshadowed/over powered by the preponderance of Malcolm's articles/etc that were populating the model press during that time. However, John O's scenic work is second to none. He is very, very creative and is a master at coloration and texture.... and his work was what... nearly 40 years ago?? I would love to view John's Mescal Lines work again. (It's been decades and I wasn't into that type of modeling then.) I may need to learn what model press mags his works appeared in and start trying to find them on eBay or sumpthin'.